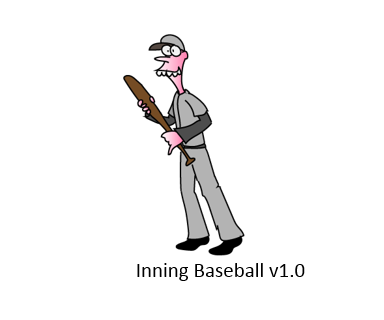 Thank you for checking out Inning Baseball 1. The instructions in this document and the ‘Quick Start Guide’ will help you start playing the game in no time. If you have any questions, please don’t hesitate to contact me jason@staben.com.au directly. Any ‘Big Hitters’ have a * (star) and will average more Home Runs/RBIs than other Batters. Very simply, each inning consists of three basic rolls of a single 6d dice…that’s it. 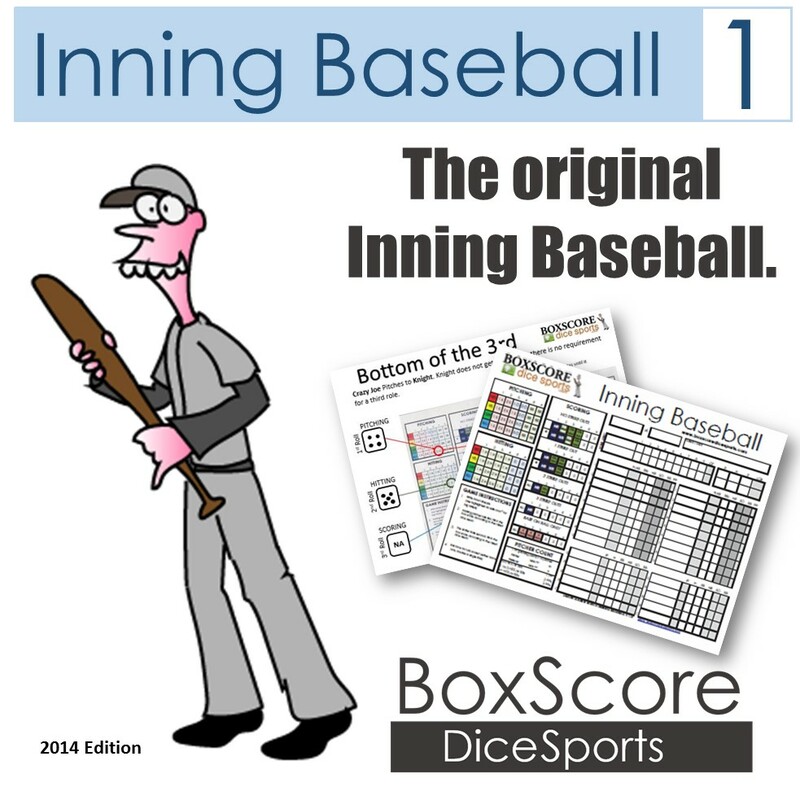 When the game is finished you will have a box score that will closely resemble a real box score for baseball. These ‘foundational concepts’ are important in understanding how a game is played. Each Batter represents a whole single inning. This is how the game is played fast, each batter represents a full inning. However, at the end of the game there is no indication that this is has been the case. Strike Outs, Base on Balls, and Outs override Hits! For example, if a Pitcher throws 3 Strike Outs, then the batter can only get a maximum of 1 Hit, no matter what he rolls. Why? Because 3 plate appearances are already accounted for. Remember, each inning consists of three rolls of a 6d dice. Roll the dice and refer to the Pitching Table. Ks and BBs are recorded in the stats, but Outs are not. The batter rolls to see how may Hits he/she can make with the remaining Plate Appearances (that are not used up by Ks, BBs, and Outs). This third roll will correspond to the scenario setup by the first two rolls. 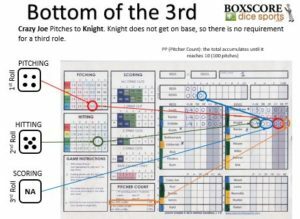 For example of the pitcher rolls 2 Ks and the batter hits 2 hits, then the roll applies to the scoring section under ’2 Strikes Outs’. In this case the batter requires a 1 to score a Home Run and bat in all the Hits, or a 2 to score a single RBI. A game will enter overtime if it is tied at the end of 9 innings. Tied games are decided through LOBs (Left on Base) and Error Runs scoring chart. See the Quick Start Guide for an explanation. Starting Pitchers have a Pitching Count. 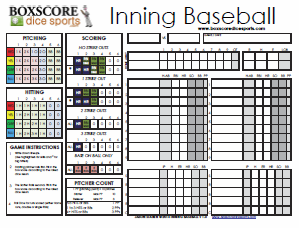 On the score sheet provided, the pitcher will accumulate PPs (Pitching Points) for each inning he/she pitches. Once 10 PPs (100 pitches) are reached/passed the starter is must be replaced by the bullpen. Bullpen pitches can only accumulate 3 PPs (30 pitches) before they need to be replaced or they will need to be rested for the next match. Per 162 games a ‘Big Hitter’ will average 30 HRs vs 18 HRs for other players. They will also typically ‘Bat-In’ more runs as a result. The DH is encouraged in Inning Baseball, purely for convenience (and logistics). However, you are free to play without using a DH and the Starting Pitcher will bat instead. In Baseball, the Home team is not required to bat the 9th Inning when they are leading. In Inning Baseball, it is recommended that you still play the bottom of the 9th regardless. Otherwise the 9th batter will not get a bat. Besides, who wouldn’t like to add 2 or 3 more runs to their lead? If you haven’t already, check out the quick start guide. It goes through an example game showing how each part of the game fits together. The GREEN skill level is considered average, so all stats are based on facing/pitching to a player with a skill of GREEN. Averages will vary depending on the skill of the opposition. Get Inning Baseball 1 FREE!